Our garden is producing tons of stuff right now. I'm really excited about all the cucumbers the kids have been eating lately. Dante was calling them cumebutters, which was really cute. 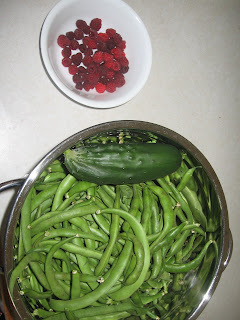 We have already picked tons of beans, cucumbers, zucchini and yellow squash, some tomatoes, basil (we made pesto this last weekend and that was really good) raspberries, & carrots. 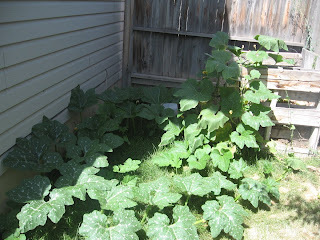 We have a couple of pumpkin plants growing, one from the compost pile at the side of the house. This is just one plant and it is a volunteer. It is also doing much better than the one in our garden. It must like the compost it lives in as well as the water from the lawn sprinklers. There are 2 pumpkins growing on the vine in the 2nd picture. I saw a few more little ones when I took the picture today. 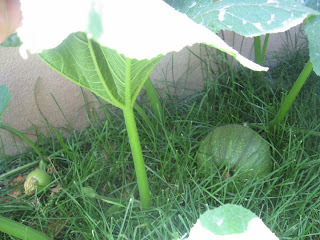 We also had a few volunteer cantaloupe plants growing in the garden, and I saw a baseball sized cantaloupe on it today. For some reason though, we have a hard time telling when they are ready to pick so they usually rot before we pick them. Maybe this year we can figure it out. Gardening sure takes practice.